Grand Rapids’ late-nineteenth century business leaders were ambitious and optimistic: striving for the greatest profit from available resources, they rationalized production workflows, integrating the latest technologies into their factories. They also took advantage of the railroad network connecting Grand Rapids to an emerging consumer economy, reaching new levels of prosperity through an industry on the verge of unprecedented growth: domestic furniture production. 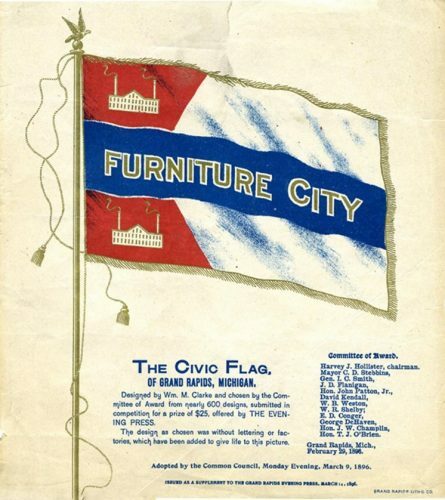 Local leaders established semi-annual furniture expositions and collaborated to make Grand Rapids’ name synonymous with excellent household furniture on an international scale. With the help of a supportive community, leaders also resolved to prevent similar efforts in other cities from eclipsing their own. Their success transformed the physical and economic landscape of Grand Rapids. *Limited Seating – Space is limited and seating is offered first come, first served. There will be an overflow room available with a simulcast video presentation. Lunch – Reserve ahead of time! Boxed lunches are $10 and must be ordered in advance. Choose a turkey, ham or vegetarian sandwich (or make any of these gluten-free). Also included in the lunches are a fruit cup, pasta salad, cookie, condiments and bottled water. Pop will be available for an additional $1.00. To reserve a lunch, call 616.988.5492 or email rsvp@grpl.org by 5:00 PM on Monday, January 23. Cash payment is due at the event. Lunches by Cherry Deli; afternoon cookies by Lomonaco Sicilian Cookies. The Kutsche Office of Local History at Grand Valley State University also sponsors History Detectives. Limited parking is available in the Library parking lot and is free with a validated parking lot ticket. This presentation is part of the 2017 History Detectives program on Saturday, January 28, at the Ryerson Auditorium, Grand Rapids Public Library.